A facebook post so raw and real, we had to share. Thank you Stephanie. I’m going to take a deep breath, and say this in love and respect to everyone who is participating. Please don’t send that to me. If it offends you that I ask this, that’s ok. If you’re curious why a perfectly healthy woman who has both of her breasts would dare not play this game, please keep reading. I lost my best friend to Inflammatory Breast Cancer. And then immediately relate my best friend to another story they heard where a woman lived. My heart aches for both of the stories. You see, both (and all) subjects of the breast cancer stories were sick. All the women – and men – who fight this disease, lump or no lump (I’ll get to that later), have to undergo the same, simplified treatment options: surgery, chemo, radiation. A lot is bad about that. I remember the day Heather told me she was going to shave her head. She couldn’t take it anymore. She was so annoyed by the massive amounts of hair shedding on her pillow, on her clothes, in the shower… everywhere. She sobbed. Shaving your hair for chemo convenience isn’t named for a purse. I remember Heather in my wedding. She picked out a beautiful purple dress she was so excited about. She swelled up from her treatments and was afraid of how she was going to lose weight for her dress. Then she changed treatments and couldn’t keep weight on. Then she started radiation treatments that were burning her to the point she wore protective mesh 24/7 to ease the irritation. Additionally, she wore a sleeve to alleviate the swelling from the lymphedema she had developed after her double mastectomy. Despite all of that, she was the most beautiful I had ever seen on my wedding day and had the attitude of an angel. Can you imagine on a hot August day, wearing an itchy wig made of real hair so you can look normal, wearing a dress that you now fit in because you’re sick and wearing a mesh pad that is sticking to you from the humidity when it’s suppose to protect the sensitive areas that hide your disease? This is not named for a bra color. One of the things Heather and I enjoyed so much before she was sick was pedicures. Oh, did we love to soak our toes! We’d gossip, drink our lattes, and laugh. Then we’d go to Barnes and Noble to find the latest trash novels. When she was told she was in remission, I bought her a gift certificate for a manicure and a pedicure. You see, when you receive chemo, all of your body’s immune system is attacked, putting you more at risk for infection. I’m sure most know that but some may take for granted what that actually means. It doesn’t mean you have to wash your hands and stay away from the daycare. It means no public transportation (no airplanes for those long drives to MD Anderson), no restaurants, no manis and pedis, no afternoon Starbucks dates where your mocha latte is swapped with your friend’s super sweet vanilla latte. On top of that, the drugs, chemicals, and radiation deplete your body of it’s ability to produce healthy nail beds. This makes touching anything: a keyboard, a purse, a steering wheel, a glass – difficult and painful. Her poor nail beds were spoons; thin, brittle, and peeling off her hands. This isn’t fruit. I can go on about other side effects of this disease and it’s treatments, but I feel like I’ve made my point. Breast cancer awareness is not a game. Breast cancer is the leading diagnosis in women’s health. But it’s not the leading killer. Lung cancer is. That’s because we can teach women to do self breast exams, we can screen with mammograms, we can implement early interventions for those who are at risk. We can only do that because the typical breast cancers you hear of most women having are researched and studied. New treatments have been found and continue to be developed. But what about Inflammatory Breast Cancer? It effects 5-6% of breast cancer patients. It doesn’t always present with a lump. It likes the young women, with no signs of it’s infection until it’s stage three… In some countries, this diagnosis is a death sentence and women receive no treatment at all. Very little is known about IBC and it’s aggressiveness. Less is known about how to treat it. I won’t even go into survival rates. Heather lived 16 months from the time of diagnosis. One of Heather’s last gifts to me was introducing me to Terry Arnold, founder of the IBC Network Foundation. Knowing and supporting Terry is a way I can keep Heather’s legacy going. She was married to David. I watched my best friend fight IBC to her dying breath. I couldn’t save my best friend with a Gucci bag, pink bra, or a banana. But you can help me save other women by educating. We are all aware of breast cancer. Not everyone possesses the knowledge of breast cancer. If you’re really wanting to make a difference this Pinktober, I encourage you to head over to www.theibcnetwork.org and learning more about IBC and donating to the research cause! Guest post by: Stephanie Whiting Pilkinton, MSN, FNP-C attended The University of Alabama Capstone College of Nursing for Family and Psychiatric-Mental Health Nurse Practitioner. She currently works in Tuscaloosa, Alabama. 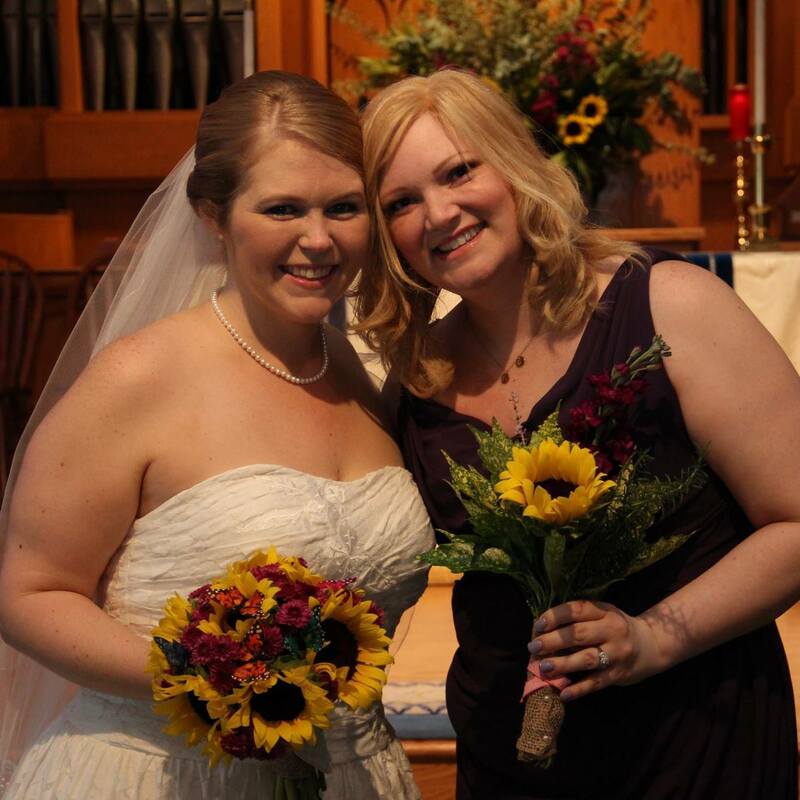 Stephanie lost her best friend, Heather Ryan, to Inflammatory Breast Cancer in 2014. Since Heather’s passing, Stephanie has been involved in the Tuscaloosa Hunt for Hope® events to help raise research funds.